Back in 2012, I wrote a post that outlined what I’d been up to for the two years that I had been on hiatus from voiceguy.ca. Well, it seems like it is time for me to do that again! I’m hoping to get back to blogging as the VoiceGuy once more, and it might be fun to do an update on my coaching and teaching life for the past couple of years. The biggest distraction from my blogging here has been my work at York University. This week marks the end of my 3-year term as Graduate Program Director for the MFA Program in Theatre. This role was on top of my usual teaching, service, research job at York, and demanded a lot more of my attention. It meant that my research really had to focus in on coaching and that left less time for stuff like this (which I guess the university would think of as “knowledge mobilization”). I quite enjoyed my time as GPD, but I will definitely be enjoying not doing it far more this coming year. Of course, I was also coaching for theatre, film and television. More recently I’ve worked with SoulPepper Theatre on a couple of projects, Gigli Concert and 12 Angry Men, both of which feature actor Stuart Hughes. I found both projects very enjoyable to work on, and so I hope to get more coaching with them in the months and years to come. This year marks my second sabbatical at York. My first sabbatical, 2007-08, saw me create the VoiceGuy blog, and a lot of coaching in theatre and, most notably, on the film Orphan(2009). My how time flies! Often, when people ask me about my sabbatical, the assumption is that I will be traveling, as many professors manage to do quite a lot of travel as part of their sabbatical time. Unfortunately, family demands make long-term travel impossible for me, apart from short jaunts to conferences and workshops. I had hoped to be spending my time working on a large project for which I had applied to SSHRC for a big whack of funding. Unfortunately, I was unsuccessful in getting my grant, so I’ll be working on other projects instead. For instance, I will be revising my workbook for learning the International Phonetic Alphabet, Introducing the IPA, and “beta-testing” what I come up with through friends and colleagues across the country and North America. The last edition of the workbook came out in 2006, and I’ve learned a lot since then, so it’s time for a major upgrade. I hope to land quite a lot of coaching work across the city this year, whether it is in film, tv, theatre, or, a new one for me, performance capture for videogames. I did my first coaching on a new DLC (downloadable content) for the next instalment of an Ubisoft franchise this week and it was a lot of fun! As one of the actors said to me, it’s like a mix of theatre (endowing the space with all sorts of qualities it doesn’t have), animation voice over work (with lots of character voices and accents), and film (as the performance capture is shot on camera as well as motion-capture. Of course, I had to sign a Non-Disclosure Agreement, so I can’t talk about it… I’d like to tell you, but then I’d have to kill you (in a virtual kind of way). This summer will also see me return to the VASTA conference, this year in London, UK. For the past 3 years I’ve been presenting with a team on various under-represented accents, with an Asian accent panel at the 2012 conference in D.C., a Scandinavian accent panel at the 2013 conference in Minneapolis, and this year, a panel on South Asian accents. I’m focusing on Tamil accents from Sri Lanka, Tamil Nadu, and Bangladesh. So that will keep me busy for the next month in preparation of the conference. I’m also overseeing a BFA student who I’ve hired to create resources for the International Dialects of English Archive (IDEA). Funded through grants from the School of Arts, Music, Performance and Design and the Research at York (RAY) program, we’re working to get as many samples recorded from IDEA’s list of most wanted accents. Filling in some gaps should make the archive more useful and comprehensive. Finally, my family is spending the summer coping with a new addition: a puppy! 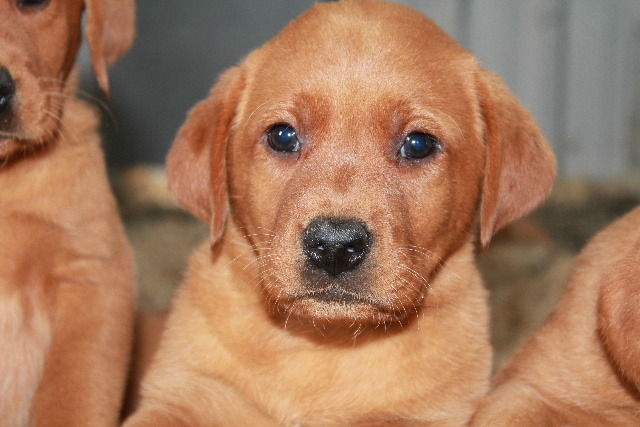 Our beloved black lab, Murphy, passed away a few weeks ago, and we’ve decided to get another Labrador Retriever, a “Fox Red” puppy that we’ve named Ember. She comes home from the breeder, Cooperslane Kennels, on July 4, and will fill our lives with joy and interrupted sleep! Ember, our new Fox Red Lab.